Seeds is a simple concept; story ideas, plot ideas, creature ideas, adventure hooks, anything that can grow into an enjoyable gaming experience. Each seed is small, only a paragraph or two at most, and they have great potential when provided with the right environment. 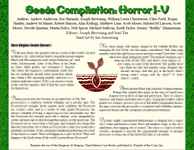 Seeds Compilation: Horror I-V is roughly 22 pages (over 110 individual seeds) packed with adventure ideas suitable for fantasy gaming.